Allegedly haunted by the former mistress of the house, Mrs. Brown. People have reported full body apparitions, cold spots, slamming doors and some claim that the ghost has actually appeared and spoken to them. Want to Spend the Night Here? 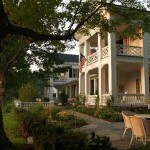 My husband, father and I stayed here on our east coast trip this past Sept.. This is an absolutely beautiful inn. I work early hours so I’m accustomed to getting up fairly early. The morning after my sleep I awoke around 4:30ish. Went downstairs for coffee and wandered around looking and found some reading on the shelves in the main foyer. I instantly heard loud snoring. I didn’t want to awaken the person. It sounded like it was right there so I peeked around the right of the cabinet in the lounge on the sofa and no one there and I then peeked around to the living room sofa and no one there. I was aghast with not being able to locate to loud snoring. I went up to my room and told my husband I hear loud snoring but odd I found no person sleeping downstairs. He immediately said “I bet its a ghost”. I couldn’t believe it but…. So when Aubrey came in that morning to get us our breakfast I told her and she said, ‘Oh, you’ve met Mrs. Brown. And her boyfriend there helping her stated, “yes, it’s usually Mrs. Brown who snores”. I wasn’t scared in the least. But found it humorous!! This is one of the most haunted places I have ever been. I stayed one night with my boyfriend last fall & we will never go back. The place scared us so badly we couldn’t wait to leave. Unexplained screams, evp’s of ghosts begging for help & constant thumping of feet in the empty hallway outside our room. Beware of this place. i love the place – got married there and went back a couple years later. On wedding night, I went downstairs late where the big TV and fireplace are. very dark or cousre and past the big safe, I heard the sound of someone swimming and shutters slamming. I went down the to little pool – water was still, but a door open and slamming. I need to go back!!!! 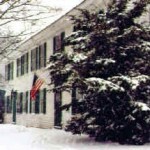 My family and I used to always stay at the White House Inn. We used to make reservations to stay in the suite every year for the week after Christmas. I have always been sensitive to spirits and changes in energy. Even as a kid, I couldn’t ignore the footsteps and creeks that would wake me up in the middle of the night whenever we stayed there. One year, something undeniable and unexplainable happened to me, which shook me to my core. On New Year’s Eve, my older brother and I were exploring the house. This place was so incredible. The secret staircases, the old structure, the creepy musky basement, the pool in the quarters were the help would stay… It was like a big and creepy playground. The walk-in safe in the basement had been kept closed in the past. This time, my brother had noticed the safe was open just a crack and decided he wanted to look inside. I stayed next to him. I was only 13 at the time but I could feel the atmosphere surrounding me changing. All of a sudden, the air felt thick and heavy. The door creaked open, and there he was, standing right in front of me. Mr. Brown looked directly at me and said clear as day, “It’s time to Get Out.” I slowly backed up, and heard my brother say “I’m sorry” and he shut the door. We never stayed at the White House inn again. It had nothing to do with the incident, but to my understanding, the Inn was sold not to long after. For anyone thinking about staying there, I would just like to clarify that this place is absolutely beautiful and to not be scared of the spirits who still linger there. I believe that they sincerely love their home and don’t plan on leaving it anytime soon. Mr. Brown for the most part stays in the basement. That’s his domain.